Thank you for stopping by. 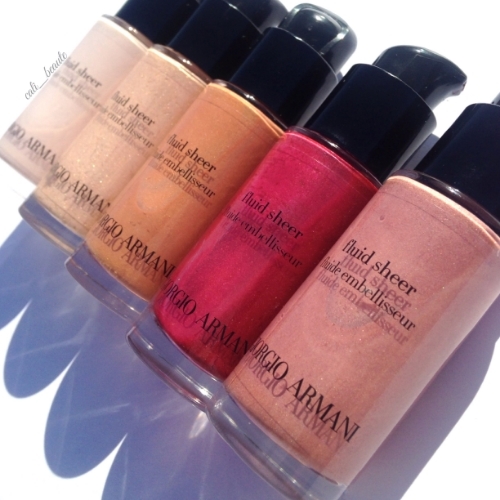 Today I wanted to write about a very versatile makeup product that you can use to define, highlight, illuminate and sculpt—the Giorgio Armani Fluid Sheers. 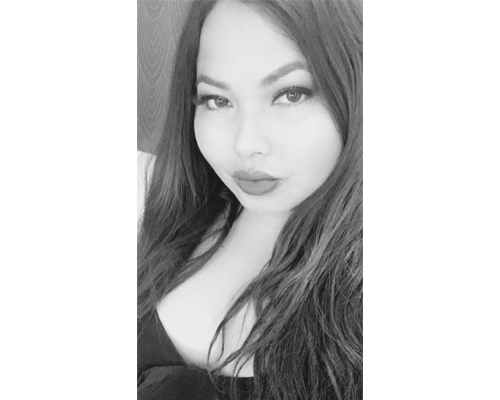 Before I begin, however, I would like to share that I currently work as a freelance makeup artist for L’Oreal Designer collections, namely YSL Beauty and Giorgio Armani Beauty. Therefore, I have used the fluid sheers in a variety of ways, not only on myself but also on many clients with various skin tones and skin types. Today’s post will go over its many uses, how tos and my overall thoughts about its performance. I hope that you will find this post informative. As stated in the About Me section, the opinions expressed in this post and my blog are solely my own. Giorgio Armani Beauty is a luxury couture brand that often draws inspiration for makeup products directly from the runway. In fact, one of their most popular and well loved products –the Luminous Silk foundation, was inspired by silk organza fabric. Mr. Giorgio Armani, the “Maestro” wanted to create a foundation that would feel as airy and light as silk on a woman’s face. In the world of Armani Beauty, it’s all about achieving the perfect radiant, Armani Glow. The fluid sheers, therefore, are meant to help women achieve a glowing complexion by allowing them to dress their skin in an ‘illuminating veil of radiance.” The liquid formula of the fluid sheers are very unique, lightweight and smooth. It can be used in endless ways as a highlighter, illuminator, makeup base, blush and bronzer. As such, it is available in a versatile range of shimmery shades. Some shades have more of a pearlescent quality while others are darker hued. It comes in an oval shaped bottle with a black pump that can easily dispense product. I’ve used the fluid sheers in so many different ways. They are lightweight, fun and easy to apply and you can mix them to create a perfectly customizable color. 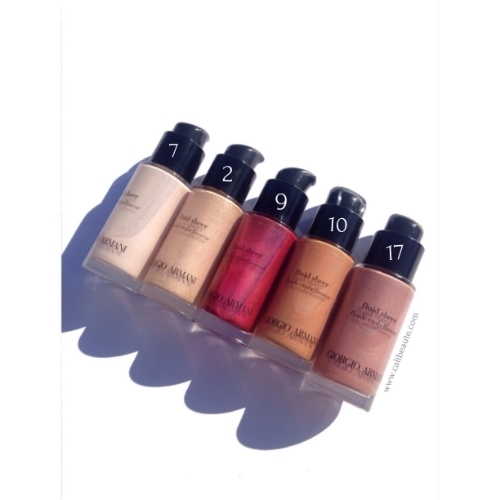 They contain light reflecting pigments that beautifully add radiance to the skin. They do not accentuate pores and blend beautifully. I typically use the fluid sheers directly after applying my foundation. I use them on the high points of my cheekbones, on the bridge of my nose, the upper bow of my lip and anywhere I want to highlight and define my features. I have used both my fingers and a small stippling brush to apply them and it works seamlessly both ways. On clients, I typically disperse a small amount to the the back of my sanitized hand and use a small brush to blend and place the product on areas of the face I want to either highlight, bronze, and/or define. They are very pigmented, especially the darker hued fluid sheers. Only the tiniest amount is needed, so use sparingly. Additionally, I have also mixed the fluid sheer with my foundation by dispersing a small pump and mixing it together for a boost of radiance and color. One of my favorite colors to use on myself as well as clients is #17, which is a beautiful, burnished rose and number #10, a shimmery golden bronze to add immediate warmth to the skin. 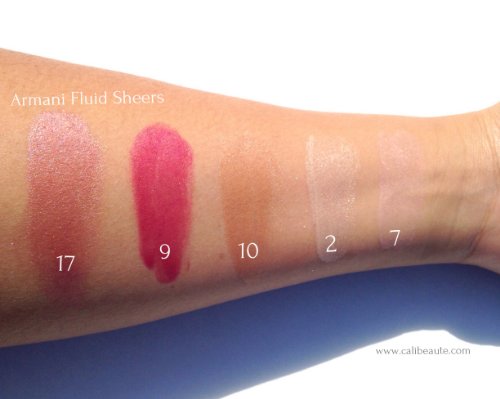 Above are swatches of each of the colors directly applied to my medium golden skin before blending. They each have a beautiful sheen to them that could not be fully captured with my camera. 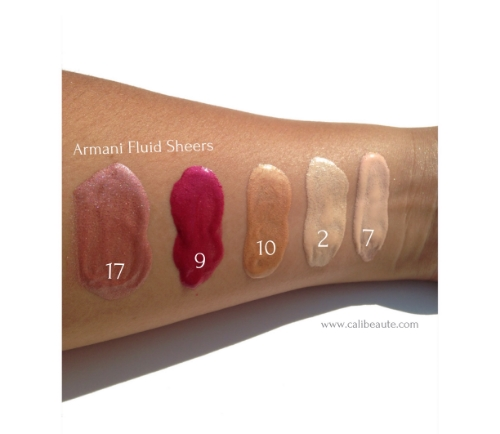 Pictured above are swatches of the Armani fluid sheers after blending. This is a wonderfully versatile product that is extremely lightweight, yet build able and is very easy to apply and work with. In terms of its performance and longevity, I typically get up to 6-7 hours of wear before fading. It immediately adds warmth and radiance to my skin and this product is truly one of a kind. The fluid sheers work well in tandem with other products in the Armani line such as their Luminous Silk Foundation and the Luminous Silk Compact, which I previously reviewed here. The foundation has a patented “microfil” technology that allows you to seamlessly apply layers without it ever looking “cakey.” Each bottle is pricey at $62 each, so I would recommended that you try it out in store before buying. The fluid sheers can be purchased from Nordstrom, Sephora or their website. This post featured products that were kindly provided as gratis. Regardless, all opinions expressed here are my own honest, unbiased views.